This quote from Steve Maraboli, in my experience, is so very true. 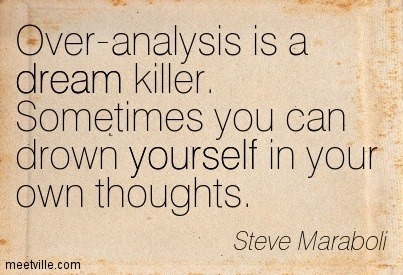 I’ve been in the deep, turbulent seas of over-thinking & over-analysis, that’s for sure. These tendencies grip our minds for many reasons I find, and aren’t only related to our dreams. They also sprout & propagate, for example, in the emotional quagmire of worry, fear, indecision, guilt, and when we’re not in control of things happening to and around us. Indeed we can drown in them. Journaling is a life-preserver. Funneling the words & feelings that comprise over-analysis & over-thinking through a pen and onto paper defines, defuses, and releases them. Once this is done we have the brain-breathing room required to ‘view the horizon’ – see positive, embrace hope, and develop antidotes. Imagine the immediate improvement to your health, too. It’s like letting the steam out of your teapot. Like exhaling & being able to breathe in fresh air. Muscles relax. Pulse slows. Blood pressure can return to normal. A smile feels possible again. Ah.